Longer ago than I would like to admit, I was at my local Whole Foods shopping, when I stumbled upon the Tepin Chile. I love chiles and heat, as much as my body can take, but I had never heard of a Tepin Chile. Normally, the story would end there but then I discovered the price: $284.99/lb. Not only do I now have no idea what a Tepin Chile is, I now have no idea why it costs as much as it does. That led me to take a picture, put it on Instagram and ask the Internet if they knew why the Tepin Chile costs $284.99/lb. Since I mentioned Whole Foods in the text, noted which Whole Foods I was at and also shared it on Twitter, Whole Foods Corporate quickly replied. @grilledshane Really hoping that’s a typo. Which store did you find this? Eventually, Whole Foods Corporate added my local store into the conversation and the answer became clear very quickly. If you’re interested (and like heat), I’d love to make you a sampler of some of our bulk dried peppers to try at home in a recipe. Please just let me know. Of course I wanted a sampler. Free dried peppers? Yum. I was all in. Not until I picked up my goody bag did I realize there were 3 cheeses included, courtesy of my local Whole Foods cheesemonger, in addition to the variety of peppers. Whole Foods FTW. I hope to use the dried peppers, including the Tepin Chiles, in a grilled cheese sandwich very soon. I simply need to do some research so I use them correctly. For these two grilled cheese sandwiches, though, I stuck with only the essentials: bread and cheese. I still have Jasper Hill’s Alpha Tolman waiting for me in the fridge, and if it is still good, I plan to make a grilled cheese with that soon. Stay tuned. For now, though, it is time to highlight the other two cheeses given to me, free of charge, by Whole Foods: Lou Bergier Pichin & Rustico Red Pepper. Lou Bergier Pichin is a corruption of the Italian phrase “The Little Shepherd.” This is a very unique Italian cheese made in the Portuguese tradition using thistle rennet. This farmstead raw cow’s milk cheese has vegetal flavors reminiscent of artichokes, grass and fresh milk, and is made on a farm with less than 80 cows. The natural rind is edible, though, for a grilled cheese, probably not desirable. 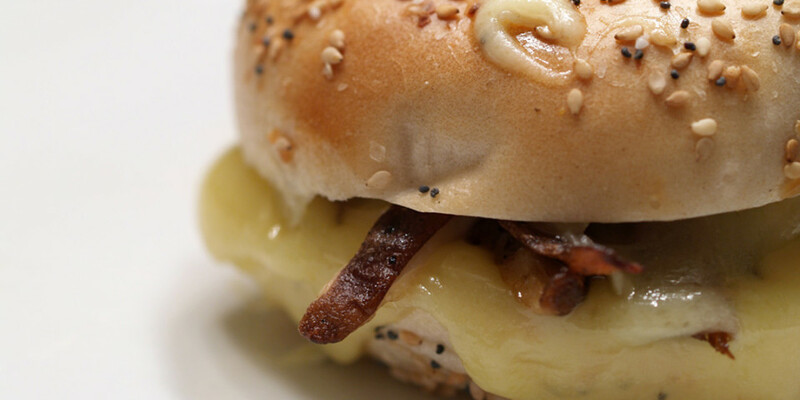 Matured for at least two months, the cheese resembles a French mountain tomme, such as Tomme de Savoie. A wheel weighs about 5 pounds and is just under 2 inches high. One look at the velvety natural rind, with its plethora of yellow, gray and white molds, and you know you are about to taste an artisan product. All the samples exhibited a fragile, open texture, with many small eyes and an abundant aroma of damp cave and mushrooms. I found hints of butter and barnyard, too. On the tongue, the cheese feels creamy and smooth, moister than many tommes, and it finishes with a pleasing acidity. You might guess just observing the rind, shrouded in a powdery coat of gray, blue, green and brown molds that this cheese will smell and taste of damp cave. Smell it most certainly does. Good specimens are thick with the sweetness of earth after a spring rain. Full of minerality and loam. The rind bears that flavor too but it is mild. The nose of the paste is dominantly butter, even buttered popcorn. The flavor is wonderful: mild, butter, cream, a little barnyard with a slight acidic finish that balances against salt. Texture is semisoft and creamy. The cheese is sold young, aged just two months (which allows US importation as it is made from raw milk – a win for us). I have included the above information for background on the Lou Bergier Pichin that I was tasting and to give another perspective on this delicious cheese. I have tried Tomme de Savoie and at the time, I was unsure that I liked it, leading towards not liking it. However, it appears my taste buds have changed/matured as I thoroughly enjoyed the Lou Bergier Pichin. Its flavor is powerful without being overwhelming or intimidating. 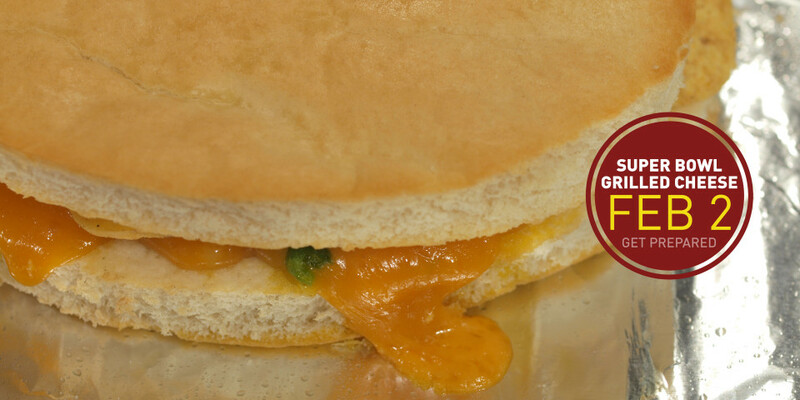 Its texture is soft and creamy without being mushy. It has nutty and earthy notes that make this cheese complex and delicious. There is something unique about the Lou Bergier Pichin that I don’t typically experience with the typical cheeses I enjoy, such as my favorite: Cheddar. As I am learning through my research, it is somewhat of a rare cheese in the United States, but if you can find it, possibly at your local Whole Foods, I would definitely recommend it. Minus the rind, it shredded great and melted perfectly, making a mild but still delicious grilled cheese sandwich. Rustico Red Pepper is a pasteurized sheep’s milk cheese—inviting, fresh creamy and delicious, but with a kick of red pepper flakes. The juxtaposition of the heat and creamy, nuttiness of the cheese is very enjoyable. In “cheese years,” Rustico Red Pepper is relatively new. It’s a flavor variation of a basic Italian cheese that’s made simply and made well. There has always been a tradition of adding spices and other ingredients to fresh cheeses and this one—which adds red pepper to Cacio de Roma—came about in the late 1890’s. Cacio de Roma, a creamy, young pecorino cheese, is made from 100% sheep’s milk in the countryside outside of Rome. Typically these semi-soft classic table cheeses are aged on wood in cellars about one month. It’s softer than Muenster and holds its shape better than Mozzarella. Rustico Red Pepper is made from the same base—in other words, it’s the same cheese—with the addition of crushed red pepper. Where as the Lou Bergier Pichin could be considered fancy or gourmet, the Rustico Red Pepper is most definitely not. And that is not a bad thing in the least. This cheese doesn’t try to be more than it is and for that reason, it is delicious. As the Gourmet of the Month Cheese Club said, this is a cheese that is “made simply and made well.” The texture is smooth while the taste is mild until you experience one of the many red peppers mixed throughout. Then, you get a great kick of flavor that changes the entire complexion of the cheese. 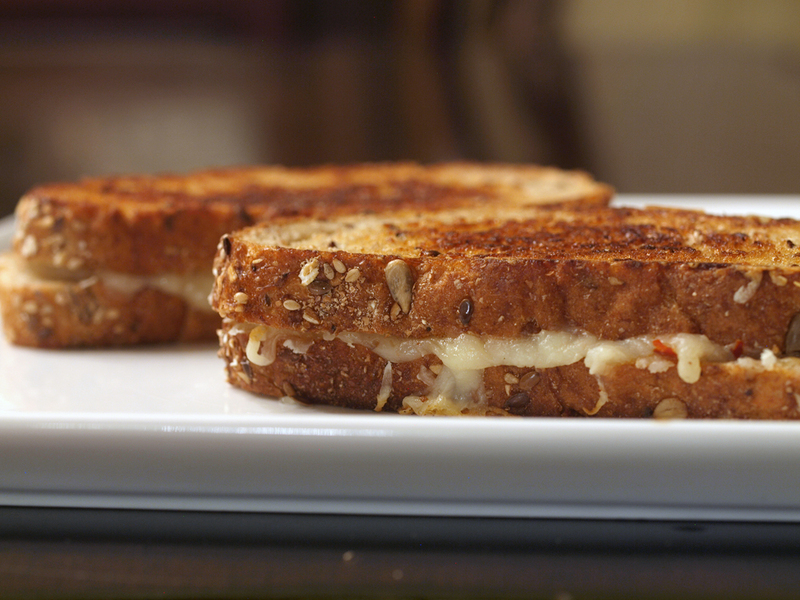 When using a cheese such as Rustico Red Pepper in a grilled cheese, there is no need to add any other ingredients as you already have your base, Rustico, and extra ingredient, red peppers. 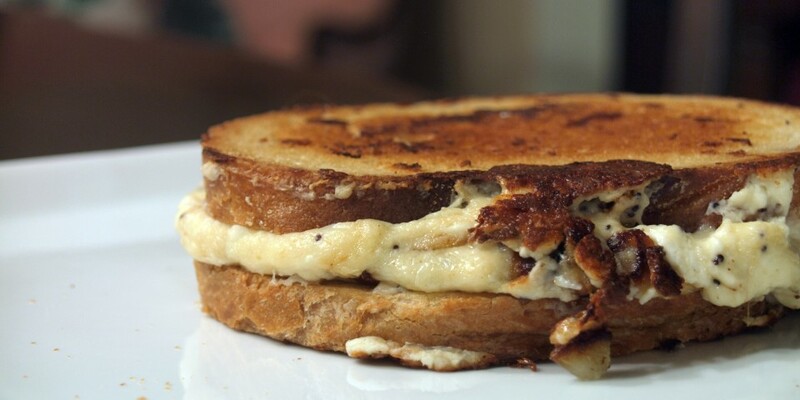 This cheese shredded very nicely and melted perfectly for a delicious grilled cheese sandwich.